Team Vector to the Rescue is an extension of Go Vector Go, developed for the DARPA Engage project. In addition to the physics concepts that are addressed in Go Vector Go, in Team Vector students also learn—in a simulated team setting—about the concepts of perspective taking. This is achieved by recognizing the emotions of others and developing empathy. The social-emotional skills addressed in the game contribute to improved teamwork, strategies that deflect bullying, and conflict resolution. Students demonstrate perspective taking by choosing emoticons to show how their teammate is feeling. They explore different approaches to resolving conflict and are shown the outcomes of each approach to learn the best solution. Classroom practices of student argumentation and discussion are transformed in the game. The game characters—depicted as young children and an occasional alien on a spaceship—model the concepts and options through discussion captured in the game. Students participate by helping the game team decide how best to fix the problem. The goal of Team Vector to the Rescue is to integrate learning both physics and social and emotional concepts through problem solving. We do the integration in two different ways. 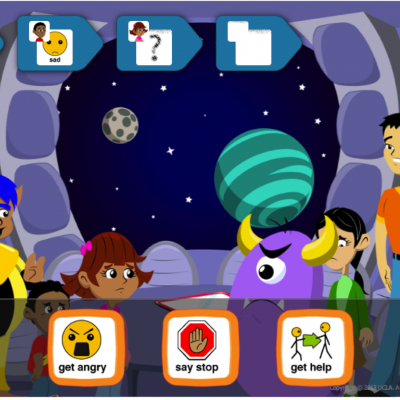 In some levels, students are given scenarios in which a friend of Team Vector is experiencing a social and emotional conflict. For example, another child steals the friend’s toy, or the friend is left out of a group activity. After solving the social and emotional conflict, the student helps the team get Vector to the friend by solving similar problems that were used in Go Vector Go. Additional game integration was achieved by having students resolve conflicts among team members when they disagreed about the physics concepts or deciding on strategies to help Vector reach his destination.